1. Sign in to an Administrator account. Use the shortcut Win Key + R to open the Run dialog then type gpedit.msc and hit Enter. Use the shortcut Win Key + S to open Search then type gpedit.msc and hit Enter. 3. 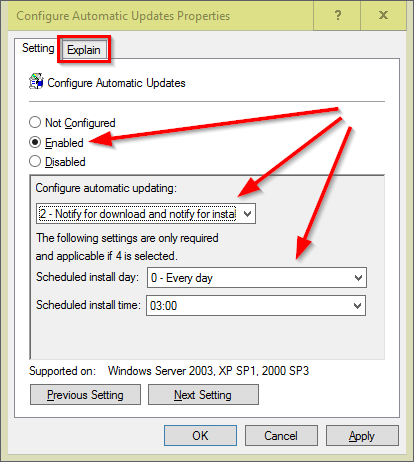 In the left pane of Group Policy Editor, expand Computer Configuration→Administrative Templates→Windows Components then click on Windows Update. 4. 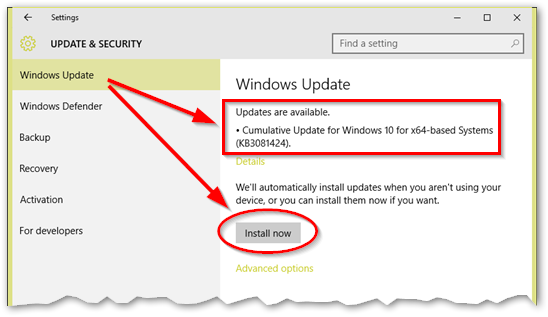 In the right pane, double-click Configure Automatic Updates. 5. In the window that opens, click on the button to Enable. You can click on the tab labeled Explain for a description of each option. You will also find options for scheduling updates on a day and time that is suitable to you. Don't get impatient if the changes take a while to show up in Settings. I didn't see the changes until the following day. Group Policy Editor is a Windows 10 Pro feature, however, there is a way that Windows 10 Home users can enable it too. I didn't post a link to the procedure because I don't know if it would be allowed but anyone should be able to find it with a simple search. BTW, most instructions for Windows 7 should work in Windows 10 too. IMPORTANT: Always backup before you make any tweak to the operating system! Group Policy Editor is a very handy tool for tweaking other system features as well. Thank you Joe, this is really useful. Okay, I want to set the record straight before I mislead anyone - the gpedit trick isn't working. Even though I've set Windows Update to "Notify for download and notify for install" updates are still being installed and I am not receiving the "supposed" notifications. Another thing I've tried is a registry edit which I found on the internet. It involves creating a new key with a DWORD value under HKEY_LOCAL_MACHINE\SOFTWARE\Policies\Microsoft\Win dows. Unfortunately, this isn't working either. Long story short, it looks like my last resort would be to connect by wifi and set my connection to "metered". However, that would be getting a bit too desperate so I'll be leaving things as they are for now. Looks like Microsoft have made things difficult in Windows 10. That's why I don't like to mess around with registry, or other such stuff. They have certainly made things difficult but I am not afraid to mess with the registry if that is what it takes to change how things work. I've gotten accustomed to fooling around in the registry and I can usually tell when an edit makes sense or not. Besides, I make backups just in case.